Situated in Sankt Martin bei Lofer, this hotel is 0.1 mi (0.1 km) from Saalachtal and 1.7 mi (2.8 km) from Almenwelt Lofer Ski Resort. 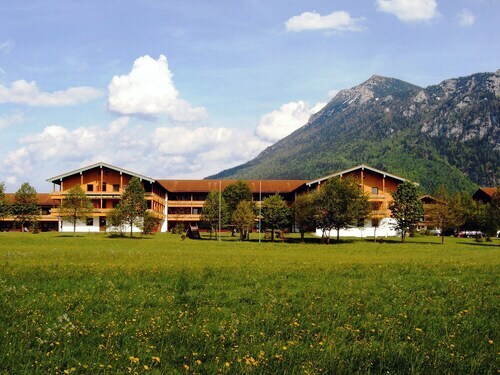 Berchtesgaden National Park and Environmental Agriculture Museum are also within 6 mi (10 km). 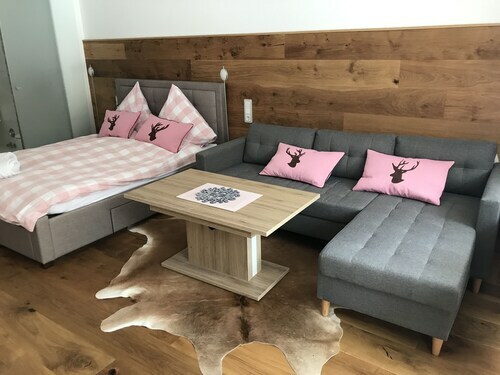 Conveniently located near the ski slopes, this Sankt Martin bei Lofer apartment building is within 2 mi (3 km) of Saalachtal and Almenwelt Lofer Ski Resort and close to winter sports such as cross-country skiing and skiing lessons. Environmental Agriculture Museum and St. Vitus and St. Nicholas Catholic Parish are also within 9 mi (15 km). Situated in Sankt Martin bei Lofer, this hotel is 0.1 mi (0.1 km) from Saalachtal and 1.3 mi (2 km) from Almenwelt Lofer Ski Resort. Environmental Agriculture Museum and St. Vitus and St. Nicholas Catholic Parish are also within 9 mi (15 km). 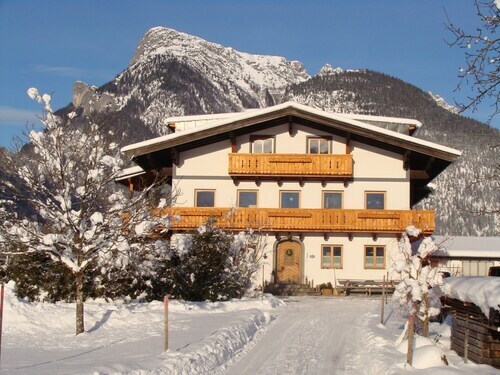 Situated in Sankt Martin bei Lofer, this apartment building is within 1 mi (2 km) of Saalachtal and Almenwelt Lofer Ski Resort. Berchtesgaden National Park and Environmental Agriculture Museum are also within 9 mi (15 km). How Much is a Hotel Room in Sankt Martin bei Lofer? Hotels in Sankt Martin bei Lofer start at per night. Prices and availability subject to change. Additional terms may apply. Are you searching for hotels in Zell am See - Pinzgau, particularly in or near Sankt Martin bei Lofer? You'll find 4 places to stay in and around town that will work for you. Accommodation options that are within manageable driving distance of Sankt Martin bei Lofer include the Haus Patricia and The Farberhaus. Investigate the Hotel Salzburgerhof or the TAUERN SPA Zell am See - Kaprun. The Hotel Salzburgerhof is located just 15 miles (25 kilometers) outside of the heart of Sankt Martin bei Lofer. 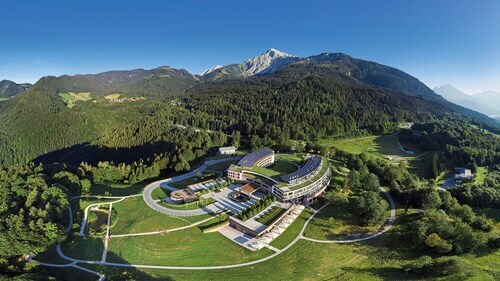 The TAUERN SPA Zell am See - Kaprun, is positioned 18 miles (29 kilometers) away. More hotel and apartment options around this area are the Alpen-Wellnesshotel Barbarahof and the The Alpine Palace New Balance Luxus Resort. After you have got to know Sankt Martin bei Lofer, you could set out to investigate the other cultural and scenic attractions of the Salzburg area. Salzburg is marked by mountains, foothills, alpine meadows and caves, and other common places of interest include castles. In this part of Austria travelers can try their hand at snowboarding and skiing. 7 miles (11 kilometers) from Sankt Martin bei Lofer, you'll find Leogang, which is where you can explore Mining & Gothic Museum Leogang and Asitz Cable Car. 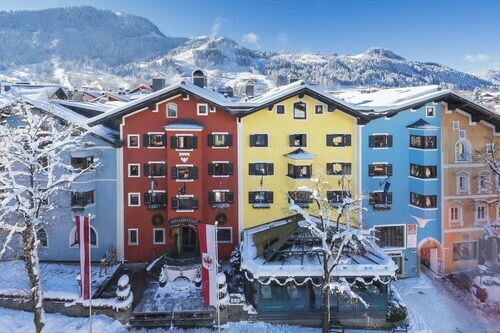 A few Travelocity-listed Leogang places to stay include the Forsthofalm and Salzburger Hof. 13 miles (21 kilometers) to the southwest of Sankt Martin bei Lofer, you can also stay at Saalbach-Hinterglemm, which is home to the Alpenhotel Saalbach and ART & SKI-IN HOTEL Hinterhag. The Saalbach-Hinterglemm Ski Resort and Bernkogel Cable Car are some of the most frequented places to experience for those visiting Saalbach-Hinterglemm. If watching sport is on your bucket list for Sankt Martin bei Lofer, make the trip to Wals Siezenheim Stadium, which you will find 25 miles (38 kilometers) to the northeast of Sankt Martin bei Lofer. Book a hotel nearby to the action at the Schloss Mönchstein Hotel or the Hotel Goldener Hirsch, a Luxury Collection Hotel, Salzburg. If you are flying into or out of W.A. Mozart Airport and want to find somewhere to stay nearby, why not consider Laschenskyhof or Sheraton Grand Salzburg. Stayed at the hotel during our spring vacation to Germany, Austria, and Switzerland. Traveling with wife and granddaughter and they both enjoyed the accommodations. The hotel was warm, clean and inviting, the staff very pleasant and helpful. My granddaughter and I enjoyed the indoor/outdoor pool, although the outdoor temperature was in the low 50s, the pool temperature was perfect. The view of the surrounding area from the hotel is lovely. I highly recommend this hotel if you are visiting the area. 5.0 An unexpected gem of a hotel. The Star Inn Hotel near the Salzburg airport was a resting point after flying 13 hours to Munich and driving part way down to Venice. The staff was very friendly, helpful, and accommodating. They were able to provide my family with a simple dinner, even with our late arrival. The room was clean, quiet and spacious even for a family of 4 with 2 teenagers. The beds were comfortable. Due to the time difference, I awoke at 3:00 AM. The gentleman who was covering the front desk was just as friendly, helpful, and accommodating when I needed assistance with the hotel’s computer. He also gave some great advice for exploring Salzburg. The morning breakfast was fantastic, the best we had on our 3-week vacation. The meats, breads, cheeses were really fresh and delicious. 2 years ago by A verified traveler from Mukilteo, WA. 4.0 So much more than a hotel room! Late arrival was easily handled. Full mini kitchen was a pleasant surprise. Everyone was friendly. English spoken readily. So sorry I forgot my swimsuit. Only down side was we had to wait until 9AM to check out since we had late check in. Reception is closed 6 PM until 9 AM. Really didn't affect the travel plans so not an issue, just something to be aware of. Slept well. Would stay there again. Beautiful hotel, but we had difficulty with the Internet service which the hotel could not fix. Otherwise the entire experience was great. The staff was excellent and the rooms are luxurious and beautifully appointed. We stayed at the Tennerhof for 5 nights end of January 2009. The property is located close to the center with a beautifull view on the sunny side. Staff ist very friendly and very good kitchen quality. The room size could be bigger, the interiour is traditional with antiques. All in all a authentic product. 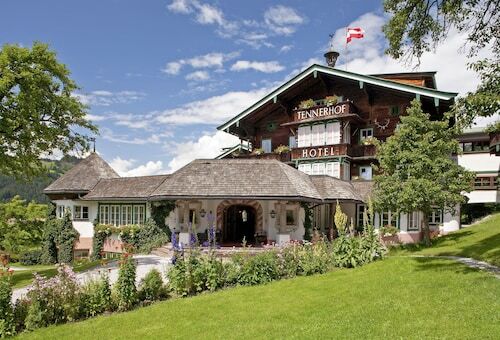 There are a couple of modern 5 star hotels - comming back to kitzb?hel we would prefer to stay at the tennerhof again. The website should be redone. Hotel has grand views of the Bavarian Alps. Food is wonderful and the hotel is next to a beautiful historic church. Second time stay for us.